"Now learn this lesson from the fig tree: As soon as its twigs get tender and its leaves come out, you know that summer is near. Even so, when you see all these things, you know that it is near, right at the door. I tell you the truth, this generation will certainly not pass away until all these things have happened. Heaven and earth will pass away, but my words will never pass away. " The cryptic language of these passages is not easy for the modern reader to understand. It should be no surprise that all sorts of strange predictions of the future try to utilize these passages for support. When something leaves us with a question mark over our head we're prone to wander off and to construct all kinds of other narratives which may or may not have any positive value for the church or the world (hence dispensationalism), just look at what the community that wrote 1 Enoch did with Genesis 6. Once again, we have to take off our Sunday School lens, as though it could get us three inches into an interpretation of this passage without some gymnastics or rigid literalism, and put on our 1 century apocalyptic lens (at least let's have the humility to try before we go nuts with strange predictions). Jesus doesn't just pull this kind of apocalyptic imagery out of the air (no pun intended), rather this kind of talk would have been familiar to his hearers as well as to Matthew's readers (once again we must try to remember the dual hermeneutic involved with gospel text). Not only would the imagery of darkness have suggested a sort of chaotic state which can be so symbolic of so many things, but Jesus is actually referring to something a little more specific. Tell me... do you think this verse sounds like it may have been on Jesus' mind: "The stars of heaven and their constellations will not show their light. The rising sun will be darkened and the moon will not give its light" (Isaiah 13:10)? Now consider that Jesus' audience may have been quite familiar with this verse too, so familiar, in fact, that they would not have been able to miss the fact that Jesus has just quoted it. And how about this verse: "All the stars of the heavens will be dissolved and the sky rolled up like a scroll; all the starry host will fall like withered leaves from the vine, like shriveled figs from the fig tree" (Isaiah 34:4). Do you think Jesus may have had this on his mind? It helps to notice that he even brings up the fig tree later on in the passage as though it's a no-brainer that fig trees should come to mind when you're talking about stars falling from the sky. These passages would have been so ingrained in the memory of the people that upon the mention of one element from the passage, all the other elements should come to mind as well. the first of these passages which Jesus is quoting is Isaiah 13:10 which pertains to the fall of Babylon and the second is Isaiah 34:4 which pertains to Gods judgment upon "all the nations" (see R.T. France's commentary on Matthew from the Tyndale New Testament Commentary series, page 346). Jesus seems to be drawing these two concepts, Babylon and "all the nations", together around the destruction of the Temple (see the last post on this). Symbolically, Jesus is asking us to understand the events of AD 66-70 and the culminating destruction of the Temple of Jerusalem as the destruction of Babylon and as God's judgment upon the nations. The language suits the magnitude of the situation and Jesus' hearers and Matthew's readers would have understood it, if only in part. What does this fall mean? It is not the cosmic finality of the universe, as many would see it. It is the fall of particular temporal powers to which the people of God have grown attached. This theme is not only found here. In Revelation the fall of "the whore of Babylon" represents the fall of a specific temporal economic system, although it invites us to look for the "whore" within whatever systems we find ourselves in. 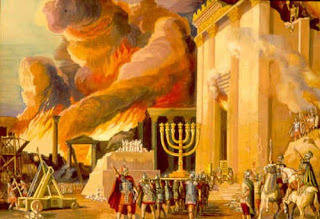 As the fall of Babylon as referred to in Isaiah was the fall of an economy of greed and of a power of oppressive injustice, so the destruction of the Temple, though ironically having been destroyed itself by oppressive and greedy forces, is the fall of a power not worthy of the Kingdom of God. This destruction, though tragically detrimental to the life of the Jewish worshiper, is in some way opening up the future to bright restoration, as God's judgment always does. That is why it is "at that time the sign of the Son of Man will appear in the sky" (italics mine). And the response of the nations (not unlike the response in Revelation 18:9-19) is mourning. "And I will pour out on the house of David and the inhabitants of Jerusalem a spirit of grace and supplication. They will look on me, the one they have pierced, and they will mourn for him as one mourns for an only child, and grieve bitterly for him as one grieves for a firstborn son." Jesus' coming on the clouds of heaven is the sign of his vindication. The system which rejected him is falling and he is receiving the glory, hence the fact that Israel mourns the one they pierced. Paired with the trumpet, the sign is the eschatological gathering of the exiles, referred to here as the "elect" which openness the eschatological gathering to even those not normally included, i.e. the gentiles, therefore the elect which may best be understood as the church by Matthew's audience takes on the role of Israel, into whose story the church is "grafted in" according to Paul (Romans 11:11-24), or at very least it is left open for re-thinking who is included in the exile. the glorious event which is to take place after the destruction of the Temple is the gathering of the exiles around not a temple but around the Son of Man--Jesus. And the angels, either heavenly angels or earthly messengers, i.e. the church, are about the task of gathering these exiles and implementing the vindication of Christ throughout the world, "from one end of the heavens to the other." The Temple, which here is about more than the Temple and it's about something very different from true worship of Yahweh, has come to an end. The Temple here becomes a snap shot of all kinds of powers and principalities which no longer have power because of the resurrection and vindication of Christ. The Church has become the Body of Christ and the temple of Yahweh, and the exile is over through the power of Jesus' resurrection. The resurrection rescue is at hand and we get to be a part of it. The next verses remind us of the fig tree, that "as soon as its twigs get tender and its leaves come out, you know that summer is near." Just when it seems that it all must be over, that death has had its victory, and we should close the book on our hope for this world, resurrection is just around the corner. This is the hope by which we live and through which we are empowered to carry on with Christ's mission of healing and salvation through all kinds of "distress." These passages offer to us a hope that even when the powers seem overwhelmingly unstoppable, the resurrection and Christ's vindication turns the powers upside down. We can look up at a temple with huge stones and say prophetically with Jesus, "not one stone here will be left on another." However tragic it may be to us that these powers will fall, due to our insatiable lust for their beauty, we are reminded that our hope is not in the Temple or in any other power in which we might seek our identity, that when the powers fall it will not be the end of the world, but our hope is in Jesus Christ and we are invited to rejoice with him in his vindication over the powers of death. The sun may be darkened but the Son will rise in glory.